The proliferation of mobile devices has led to renewed focus on products designed to give consumers better access to in-home broadband. 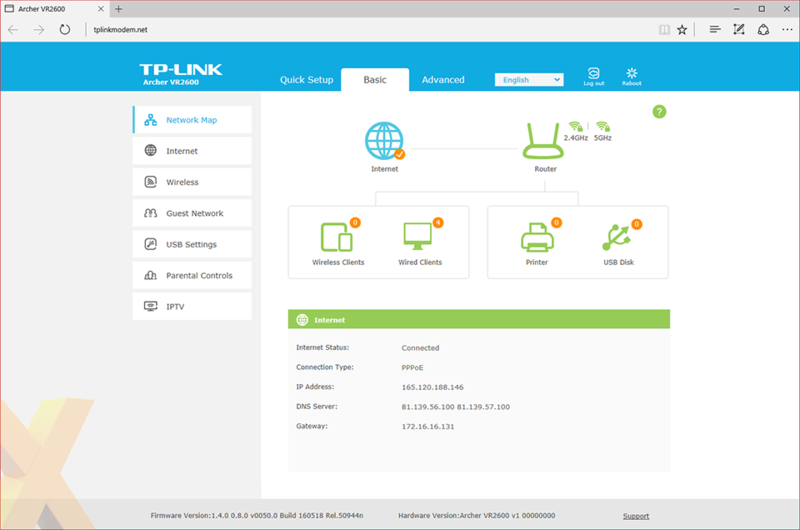 Routers, access points and range extenders all come to mind, and TP-Link, having recently undergone a brand revamp, remains at the forefront of this market segment with an ever-expanding range of network solutions. Priced at around £200 and designed with the modern home in mind, TP-Link's black box is reasonably sleek, though with four good-sized antennae protruding from the rear, it's never going to be considered a particularly handsome addition to a living room. It's hardly inconspicuous and, if you're thinking of tucking it away on a shelf, you should note that the VR2600 base unit is no shrinking violet, measuring 264mm x 198mm x 37mm in size. Keeping the design nice and simple, the top of the device is home to a small, unobtrusive power LED as well as a column of status indicators. 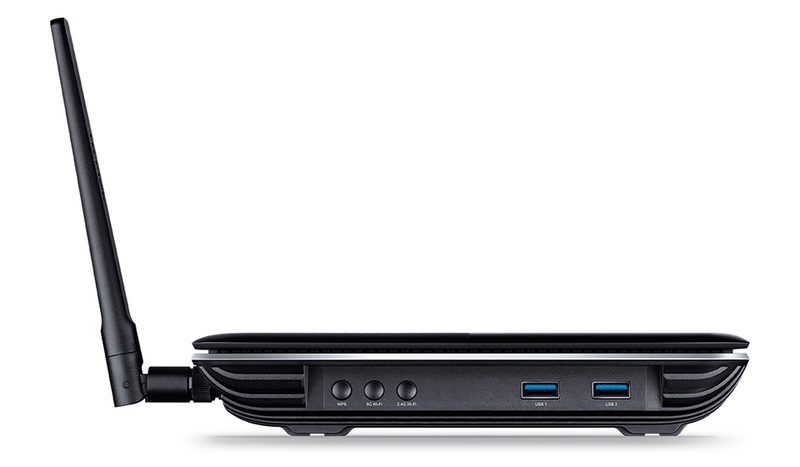 The left edge features two USB 3.0 ports alongside toggle switches for each of the wireless bands and WPS, while the bulk of the connectivity options are tucked neatly around back. Here's where you'll find a dedicated power switch, a connector for the mains adapter, four Gigabit Ethernet ports, Gigabit WAN and a port for the built-in modem. 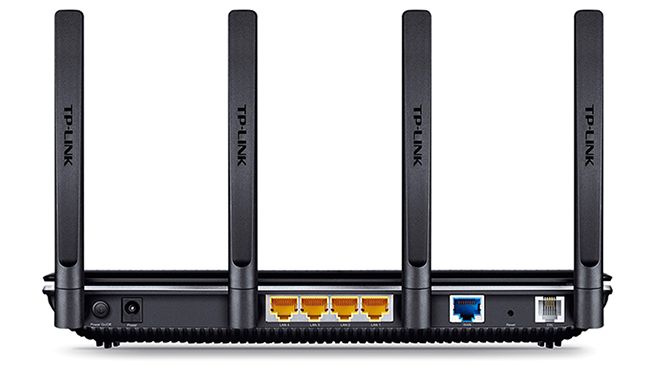 As was the case with the VR900, the built-in modem serves as a genuine value-add as it supports all the standard DSL services you'd expect, including VDSL2, ADSL2+, ADSL2 and ADSL. That means you're good to go if you're on, say, BT Infinity or an equivalent fibre-optic service, and you needn't worry about compatibility with Cable - plug in your modem via the WAN port and hey presto. Heck, even if your home broadband experiences an outage, the USB ports allow for the use of a 3G/4G dongle, so staying online shouldn't be a concern. Versatility is without a doubt the VR2600's strong suit, and TP-Link continues that theme with support for some of the latest networking standards. Making good use of the 2.4Ghz and 5GHz bands, WiFi performance is rated as up to 800Mbps and 1,733Mbps, respectively, with the added benefit of MU-MIMO. The latter, in case you were wondering, allows multiple clients to be serviced simultaneously to further improve WiFi efficiency. Beneficial technology, though there is a catch in that client devices must feature MU-MIMO-capable hardware, so chalk this down as one for the future. 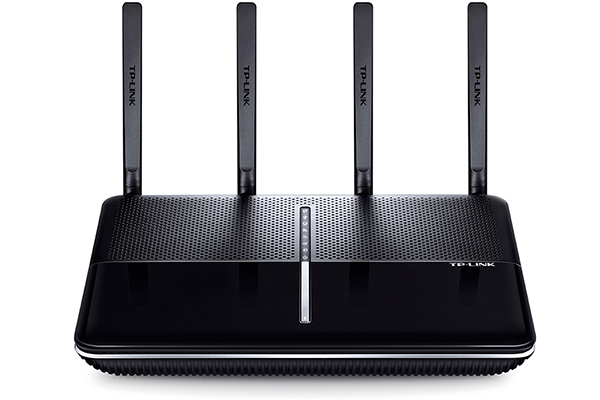 The Archer VR2600 is by no means TP-Link's fastest wireless router - the £350 Talon AD7200 has it beat comfortably with theoretical combined speeds of 7,200Mbps - but it is the quickest to feature a built-in modem, making it a sensible choice for users looking to upgrade from an ISP-supplied box. 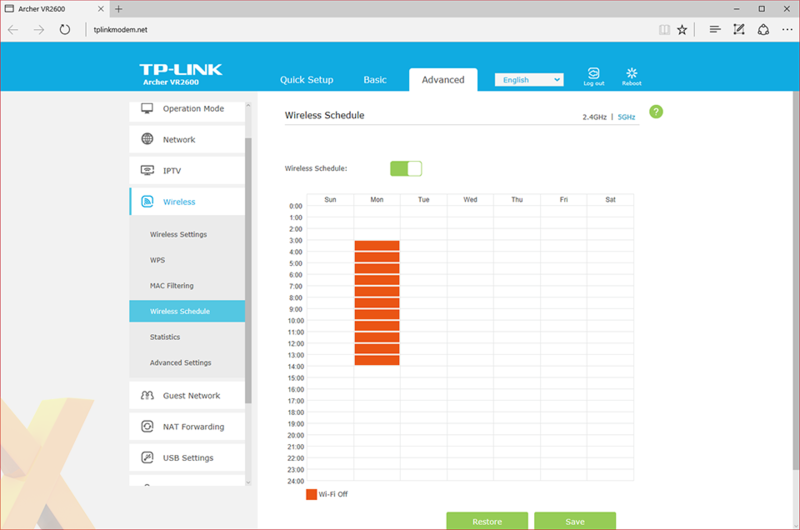 Understanding that ease of use is going to be vital, TP-Link's admin panel hasn't changed a great deal and the setup process effectively mirrors the existing VR900. 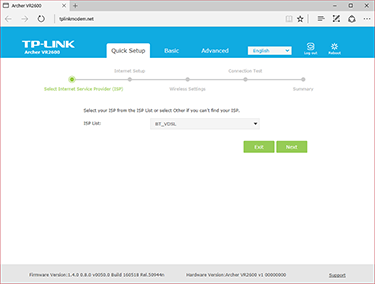 Point the web browser of any connected device to tplinkmodem.net and the Quick Setup wizard runs through the installation in no time. 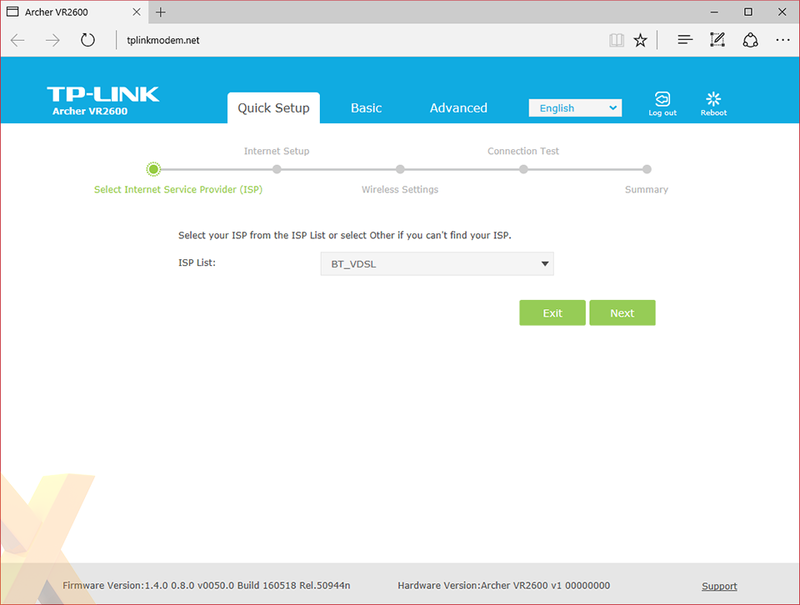 The software correctly identified our BT Infinity connection and by default created and enabled two WiFi SSDs for each respective band. 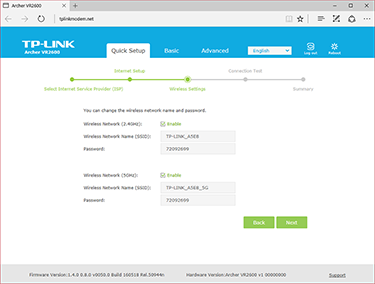 Do note that the same SSID can be used for both, and doing so puts the onus on attached clients to dynamically choose a preferred network. The setup procedure should take no longer than 10 minutes at most, and once up and running users are then able to explore the VR2600's array of features in a choice of basic or advanced menu systems. 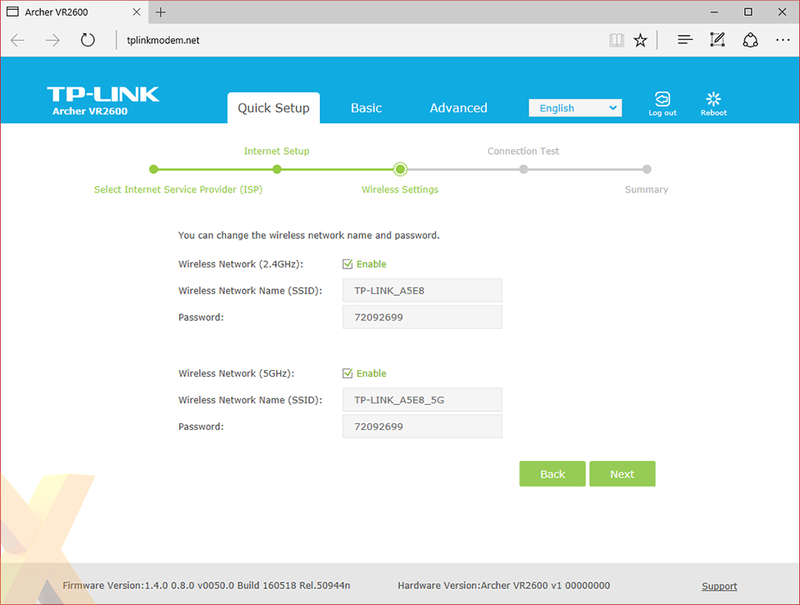 The highlights include the ability to create guest networks on both available bands, file or printer sharing via the USB 3.0 ports, and parental controls that can limit Internet access to a time schedule on a per-device basis. Getting considerably more granular, the advanced tab offers everything from port forwarding to VPN passthrough. 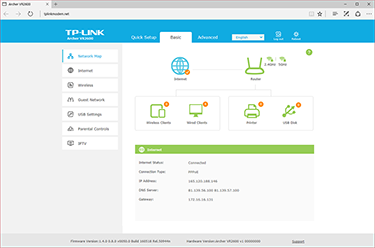 A dual-core 1.4GHz processor (up from 1GHz on the VR900) keeps the interface feeling nippy throughout, and though firmware updates still aren't automated, TP-Link has added a live update option to give customers easier access to the very latest software. As a further incentive, buyers are further 12 months of product warranty upon registration, taking the total period of cover to three years.